One of the downsides to owning a home is the fact that you are solely responsible for handling any major repair issues that may arise. Dealing with a burst water pipe can be a serious issue, so it’s important to have the number of a few reputable Kamloops plumbers on hand in case of this type of emergency. If you suspect a pipe is broken, there are a few steps you should take to minimize the damage before calling an expert in plumbing and heating in Kamloops. Whether you know where the water is coming from or not, it’s vital to shut off your water as soon as possible. Be sure that everyone in your family knows the location of the stopcock and how to operate it. Kamloops plumbers often recommend refreshing your family on how to turn off the main water source once or twice a year. It may also be necessary to turn off electricity if the water is leaking near anything electrical. It’s commonly recommended to switch off furnaces and air conditioning in Kamloops to ensure the safety of your home. Once the water is off, you must drain the residual water left in the pipes. This means that you should flush each toilet once and run the cold water in all sinks and showers for a few minutes. Once this is done, turn off your hot water heater, and repeat the draining process in each sink and shower. Doing this dries up the water supply and will stop the leak. Often, it’s easy to locate a broken pipe because the majority of the leakage will be concentrated in that area. 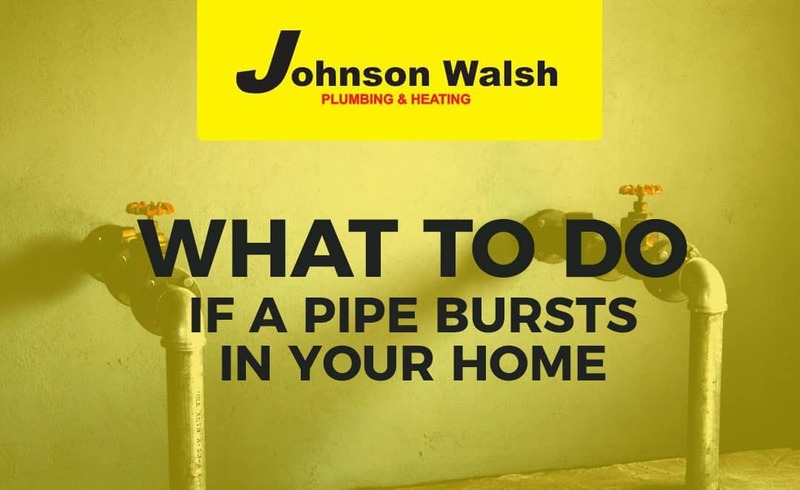 Knowing where the pipe has burst can be helpful for when you call in an expert on plumbing and heating in Kamloops. Unless the leak is very minor, it’s usually best to call in a professional for help. Plumbers or air conditioning experts in Kamloops will be able to assess the damage and recommend the best course of action for you. Once the pipe has been repaired and the water turned back on, be sure to run the hot and cold water and flush all of the toilets before resuming normal usage. Whether you have a burst pipe, issues with your fireplace or furnace in Kamloops or need an air conditioning expert, our team at Johnson Walsh Plumbing and Heating has years of industry experience. We will be sure to provide you with the right products and services for your needs.